Frederick was born in Hungerford in 1884 the son of William Charles Hollister and his wife Mary Ann. His birth was registered as that of Lewis Frederick Hollister but he was known as Frederick from an early age, appearing as Frederick or Frederick L in census returns from 1881 to 1901. The Hollister family was a large one, Mary Ann gave birth to nine children: Clara Louisa (born 1878), William Charles George (1879), Lilian Ann (1881), Oliver Worthy (1882), Lewis Frederick (1884), Alfred Ernest (1887), Percy (1889), Sidney Frank (1891) and Edgar (1893). By 1901 Frederick was working as an iron-moulder, as was elder brother William. The boys would have been employed by a local foundry, which may also have employed their father who made his living as a blacksmith. Of course their father could also have been in business on his own, this was an age when the blacksmith was a familiar part of life. After a while Frederick made a critical career change – and joined the Cavalry. 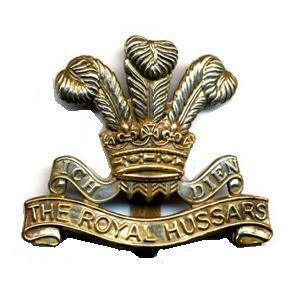 He enlisted with the 10th Hussars; his service number (5544) is among those allocated in 1905. By 1911 he was in India with his regiment and is recorded in the 1911 census as Hollister, Louis Private, 10th Hussars. When war was declared in August 1914 many of the troops scattered around the Empire were recalled to England; by this date the 10th Hussars were in Potchefstroom, South Africa, and were soon on the move. Arriving back in England they were sent to Ludgershall, Wiltshire, to join up with other returning units to form the 6th Cavalry Brigade in the 3rd Cavalry Division. On 8 October 1914 the Division landed at Ostende, part of a force sent to aid in the defence of Antwerp. However, Antwerp surrendered the day after they landed and they were sent to Bruges to join up with the 7th Division (infantry) in support of the retreating Belgian forces as they withdrew towards the River Yser. For the next 12 days they fought skirmishes and defensive action as cavalry before, on 21 October, being ordered into the trenches for the first time at Zandvoorde. The 1st Battle of Ypres was underway, a major German offensive against the combined French, Belgian and British forces defending a line stretching from the North Sea across western Belgium into France. At the centre of the line was the Belgian town of Ieper (Ypres) around which the line bulged to make the notorious Ypres Salient. The Allied lines bent but didn’t break – every time the Germans overwhelmed a unit there was someone there to stop the Germans making the breakthrough they sought. It was a desperate struggle, every available man was thrown into the maelstrom; the little British Expeditionary Force (BEF) under Sir John French was stretched to its limit, but, somehow, held on. Fresh divisions arrived from England and India just in time to plug gaps and allow some of the exhausted troops of the original BEF to grab a short rest. Soon the new troops were as exhausted as their more seasoned comrades. About noon on the 1st November, orders were received to march to the road junction on the Hooge – Kleinsillebeke road and support the 2nd Infantry Brigade, who were being hard pressed. One dismounted squadron of the 10th Hussars supported the left of the line and two squadrons of the Royals filled a gap on the right caused by the Irish Guards being forced to fall back. Captain W O Gibbs (10th Hussars) and Lieutenant G Pitt-Rivers (Royals) were wounded, 2 men were killed and 9 wounded. It was a day like many others during the battle, special only because this was the day that Frederick died, one of the 2 men killed (the other was Edward Gomersall). Neither body was recovered; both men are remembered on stone GG in bay 5 of the Menin Gate memorial to the missing in Ieper. His parents moved to Newbury, probably in 1916, first appearing in the town directory of 1917. Thus it is their Newbury address that is recorded by the Commonwealth War Graves Commission and is included in their Debt of Honour online database. They remained in Newbury until their deaths, Mary Ann in 1923, aged 72, and William in 1937, aged 86. When the appeal was made for the names of lost loved ones to be put forward for inclusion on the Newbury memorial the organisers would almost certainly have included Frederick had his parents suggested it. However his parents would already have known that he was commemorated on the Hungerford memorial (as L F Hollister) which had been unveiled the previous year and probably felt that this was where his name belonged; after all he had flown the nest long before they moved to Newbury. His name is also remembered on a roll of honour in Hungerford Town Hall and a memorial triptych in St Lawrence's Church, Hungerford. William (born 1879) does not appear to have served, very possibily being unfit for service – he died, aged 44, in 1921. There is no record of Oliver Worthy (1882) having served, but many who served in the UK, never entering a Theatre of War (which were clearly defined by the military), have left no trace of their service because the majority of service records were destroyed during WW2. In 1920 Oliver emigrated with his family to the USA. He lived in Maryland where he died in 1951. Nor is there any evidence that Alfred Ernest (1887) served in the armed forces. He died in Scunthorpe in 1970. According to the local paper Percy (1889) served with the Royal Berkshire Regiment and there was a P A Hollister present at a Christmas lunch for the Newbury Company of the 1st/4th Battalion in 1914. However there is no evidence that he went overseas, though it is possible that he transferred to the Hampshire Regiment, probably in a labour battalion for this Percy Hollister transferred to the Labour Corps. It is worth noting that the Hollister boys were the sons of a blacksmith, if they had picked up smithing skills in their youth they may well have been considered too valuable to be used as infantry. They could, for instance, have served the war out in a Remount Depot shoeing some of the hundreds thousands of horses that were sent to the front. Sidney Frank (1891) has a complicated record (one of the minority to have survived the fire in WW2): he enlisted into the 3rd Battalion, Royal Berkshire Regiment on 24 April 1915. This was a training/reserve battalion that never went abroad, most men would spend around six months with the battalion before being posted to an active battalion at the front or to some other unit such as a labour company that is directly supporting the war effort. However, Sidney stayed with the 3rd Battalion until 11 November 1916, suggesting that he was not fit enough for combat duty. He was transferred to the 10th Battalion of the Somerset Light Infantry (SLI). This was a brand new battalion that was formed in November 1916 as a home service battalion. During his time in training he found himself in trouble on a number of occasions from small misdemeanours (not getting his hair cut, absent for 30 minutes (presumably late back to camp after a night out), coming on duty without shaving, etc each offense being punished by a few days CB (confined to barracks). When he joined the SLI he was soon in trouble again – Absent from kit inspection & from billet while on light duty – 20 days CB. It seems that once as enough for the SLI, Sidney was transferred to the 13th Battalion, Devonshire Regiment on 23 January 1917 after barely two months with the SLI. This was a works battalion, it was not expected to fight but to provide labour for the huge number of tasks carried on behind the lines that were vital to ensure that the frontline troops had everything they needed from socks to shells, from drinking water to delousing powder. On 4 February, a few days after the posting he landed in France where he returned to the Royal Berkshire Regiment as a Private in the 10th (Labour) Battalion. On 5 April 1917 he became a member of the 158th Company, Labour Corps, one of two companies created from his battalion when the Labour Corps was created and took over the infantry regiments’ labour battalions. On 5 October he moved again, to the 77th Company, Labour Corps. On 30 March 1919 he was discharged to the Class Z Reserve (most soldiers were discharged in this manner – which left them liable to recall should hostilities break out again). Unlike most soldiers his military story does not end at this point; his records include a form dated 22 April 1924 recording the rejection of a pension claim. The form makes stark reading – Stanley is in an asylum, his condition is classified as imbecility – the army clearly deny that his condition was caused or aggravated by his service. No doubt his family disagreed! Reading between the lines of his records it is hard not to see some evidence of mental illness in his regular moves and disciplinary record; if so, sending him to work at the front could well have aggravated his condition (Labour Corps companies were used very close to the action and lost many men, notably to enemy shellfire. Owing to his patchwork career he accumulated five service numbers: Royal Berkshire Regiment – 17583 & 34301; Somerset Light Infantry – 32836 or 50919; Devonshire Regiment – 50919 or 32836; & Labour Corps – 94421. An Edgar Hollister served with the Royal Engineers – another unit that would find a blacksmith/metalworker very useful – but it is not known if this was Frederick's brother Edgar (1893). One interesting aspect of their service is that of none of the Hollister boys is recorded on the section of the Roll of Honour, displayed in Hungerford Town Hall, that lists the men and women from Hungerford who served in and survived the Great War.